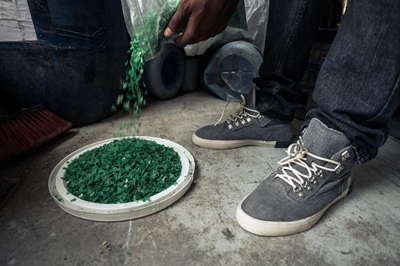 Global outdoor lifestyle brand Timberland launched the Timberland X Thread collection in partnership with Thread, a Certified B Corporation that transforms plastic bottles from the streets and canals of Haiti into what Thread calls "the most responsible fabric on the planet." The collection goes beyond environmental sustainability, creating social value and impact in the form of cleaner neighborhoods and meaningful new job opportunities. The new Timberland X Thread shoes, t-shirts and bags are available in Timberland® stores and at www.timberland.com. "The Timberland X Thread collection is incredible proof that style and sustainability can go hand-in-hand," said Colleen Vien, director of sustainability for Timberland. "This collection delivers good with every fiber, not just by recycling plastic bottles that would otherwise end up littering the streets, but also by creating job opportunities and cleaner neighborhoods in Haiti. Consumers can feel good about pulling on their Timberland®X ThreadTMboots or backpack, and know they are making a positive impact in someone else's life." The new products build upon Timberland's longstanding commitment to be Earthkeepers – to innovate and operate their business in an accountable and responsible manner. With a shared passion for supporting communities in Haiti, Timberland and Thread were natural partners from the start. Both companies are determined to look beyond the environmental value of recycled plastic bottles to focus on responsibility, transparency and creating social value. The Timberland X Thread collection includes five styles of men's footwear, two bags and one t-shirt, all made using Thread™ Ground to Good™ fabric: The shoes and boots are crafted with durable uppers in Thread™ fabric made with 50 percent post-consumer recycled PET, a 50 percent recycled PET mesh lining for comfort and breathability, and a durable outsole made of 15 percent recycled rubber. 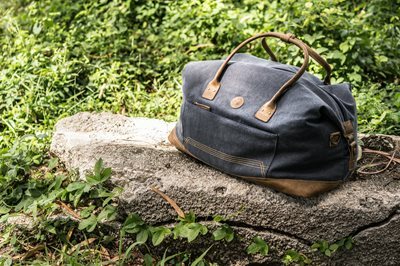 The duffel bag and backpack are made with Thread™ fabric and waterproof leather trims. ?The t-shirt is made with 50 percent Thread™ fabric and 50 percent reclaimed cotton from fabric scraps. 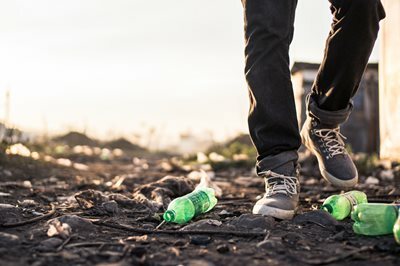 The process of going from "bottle to boot" begins in Haiti, where more than 1,300 locals collect the plastic bottles that are developed into Thread™ fabric. Each yard of fabric is traced and tracked at every step of its journey, from bottle collection and fabric creation to the delivery of the fabric bolt to the manufacturer. This transparency allows Timberland consumers to learn about the vibrant people, stories and the impact metrics behind each boot, shoe, bag and t-shirt they purchase. Timberland will share powerful stories, photos and videos about the people behind the Timberland X Thread collection online and in stores beginning this week. "At Thread, we believe that dignified jobs cure poverty – and our fabric creates those jobs," said Ian Rosenberger, founder and CEO of Thread. "Our partnership with Timberland marks a seismic shift in the fashion industry, combining Timberland's large supply chain and loyal customer base with Thread's responsible, transparent approach to creating premium fabrics and vital jobs in the developing world. The Timberland X Thread collection is a major step towards improving the way our clothes are made." The partnership comes on the heels of Timberland's support of Thread's Clinton Global Initiative (CGI) Commitment to Action, which addresses the problem of undignified and child labor in global supply chains, with a targeted focus in Haiti. In addition to this effort, Timberland continues supporting the people of Haiti following a five-year tree-planting effort to help smallholder farmers reach self-sufficiency. Timberland hopes to potentially transition from being an early supporter of the smallholder farmers, to being a customer, purchasing cotton for the brand's supply chain. For more information on Timberland's commitments to environmental and social responsibility, including the brand's work in Haiti, visit www.timberland.com/responsibility.